Something special happened on this past Thanksgiving weekend, and it was something I had been planning for the past five years. In August of 2009, my first son was born and it was a distant wish at that time that one day I’d get to take him hunting with me. After all, not every son or daughter grows up to love the same things their parents love, and my wife and I had long previously agreed that neither of us were going to force our hobbies and pastimes on our kids. As the years passed and my rubbery infant son became a rambunctious, energetic toddler, I made not-so-subtle attempts to ingrain a love of the outdoors and hunting into the boy. 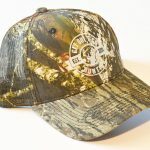 I provided duck and goose calls as toys, I tucked him under my arm as I watched hunting shows on TV and I often took him into the nearby county forests for nature hikes that, while not technically hunting trips, were always framed as such. I recall a distinct morning in 2012 when my son and I went twenty minutes up the road to a Halton Region county forest tract and walked the wide trails in a new fallen snow. I pointed out deer and rabbit tracks to him, and he made it a point to follow the prints as far as he could. He was beaming and laughing, and I was pretty sure that I had him on the right track. 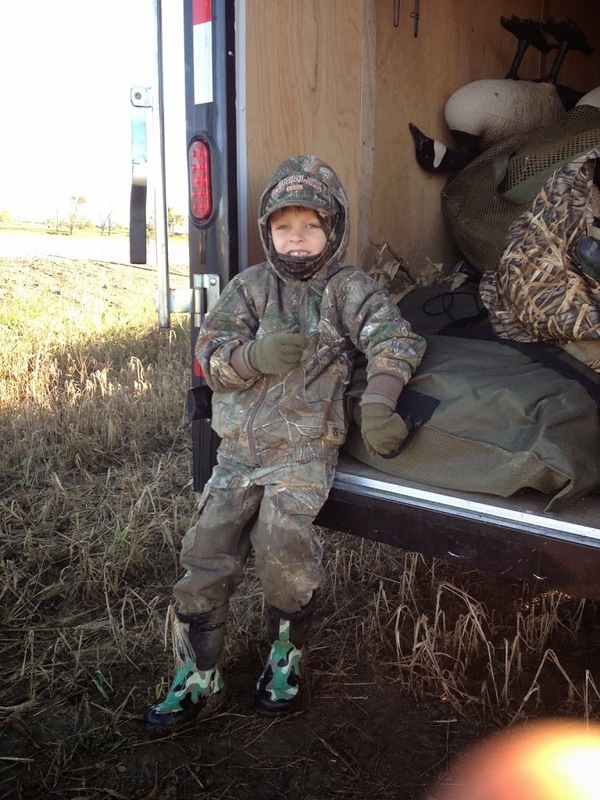 My toddler son grew to become a small boy, one that was now imaginative and willful, and he began to express disappointment as a three and four year old that he couldn’t come with me to various goose, duck, deer, and turkey hunting trips. He pestered and asked constantly, crying and sulking when I would earnestly tell him he was too little and too young to participate. He had not yet learned even the basics of sitting quietly and he was well in advance of developing anything that a parent could characterize as ‘patience’. Some people, my wife specifically, accused me of not wanting to bring him along as a selfish gesture, thinking that I was concerned with my own success and the possible negative impacts a small, loud, mobile child would have on my hunting results. The fact of the matter was quite the opposite. 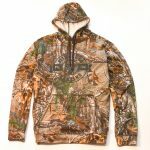 My primary concern was that my son’s first hunting experience should be one that was fun, in good weather, and surrounded by action and wild game. 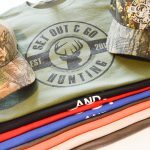 Deer hunting and turkey hunting can feature extended periods of inaction, and I certainly didn’t want my boy to think hunting was ‘boring’. At that moment I decided that when he reached his 5th birthday I would take him on his first waterfowl hunt. 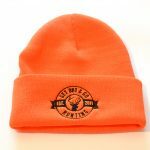 In my estimation, hunting ducks and geese is probably the absolute best way to bring a youth of any age into the hunting tradition. Game is usually active, and in the case of Canada Geese in my area, it is plentiful. For the most part, when the birds aren’t flying the kids can move around, talk, fidget, and generally just be kids. I also find that (my boys at least) really like the noise and commotion around waterfowl hunting, what with setting up and tearing down decoy spreads, the music of the duck and goose calls, waving of flags, and the frequent shooting. That said, hearing protection for young ears (and old ears too I would suppose) should be absolutely mandatory. And so it was that on the October long weekend I went to bed too excited to so sleep. I remembered my first waterfowl hunts as a young boy and the impression that they made on me; to say I was feeling the pressure to provide a good hunt for my son would be an understatement. 5am came on early, as it usually does, and my alarm buzzed me awake. I was sharing a room at the farmhouse with my son, primarily because my wife didn’t want me to wake her or my other son (who is just a tender 2 year old). When I walked across the room and tapped him on the shoulder, he sprang to life, literally. 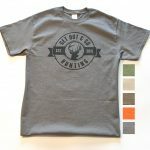 He hopped out of bed and made for his hunting clothes with an energy that I don’t ever remember having. 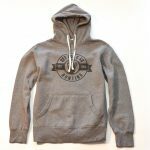 It was a somewhat chilled morning, and I went through the ritual layering of long underwear, multiple socks, and warm shirts twice in the farmhouse living room; once for my son and once more for me. It was not an emotional morning overtly; there were no clichéd moments of hair-tousling or teary smiles, or even hugs. We just got our equipment on and headed out the door. Our large group of hunters met at a local gas station and planned the hunt. 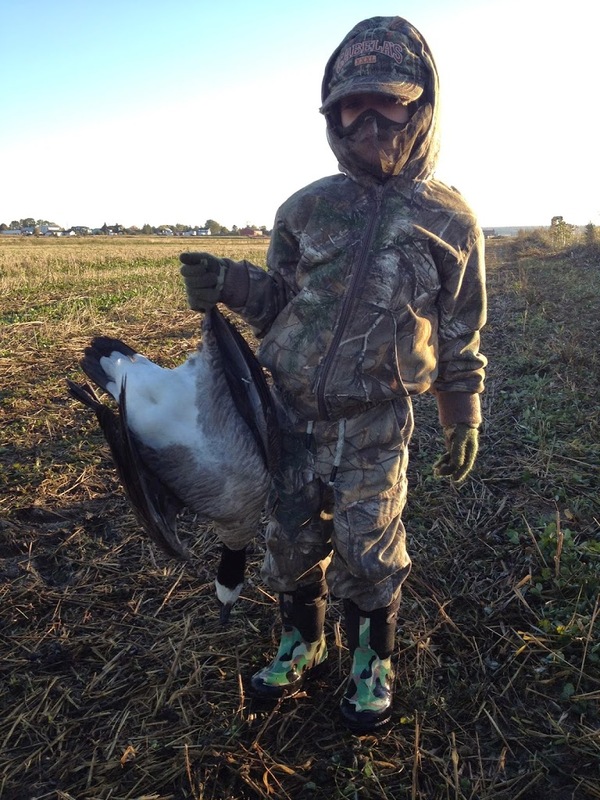 My son and I, along with three others would go to a nearby cut grain field that geese had been frequenting which was adjacent to a field of standing corn. The plan was to hide in the standing corn and go from there. 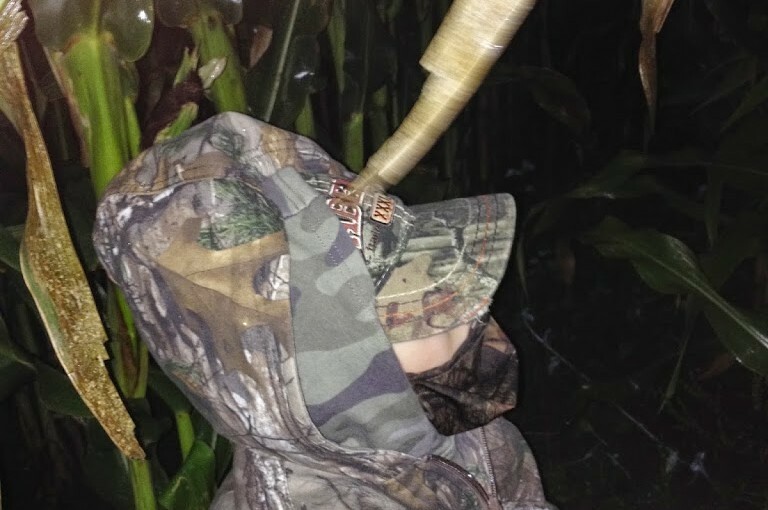 We set decoys under the waning moonlight of a rapidly approaching October dawn, and my son rambled around in the shadows, carrying Bigfoot decoys in an awkward but capable fashion. 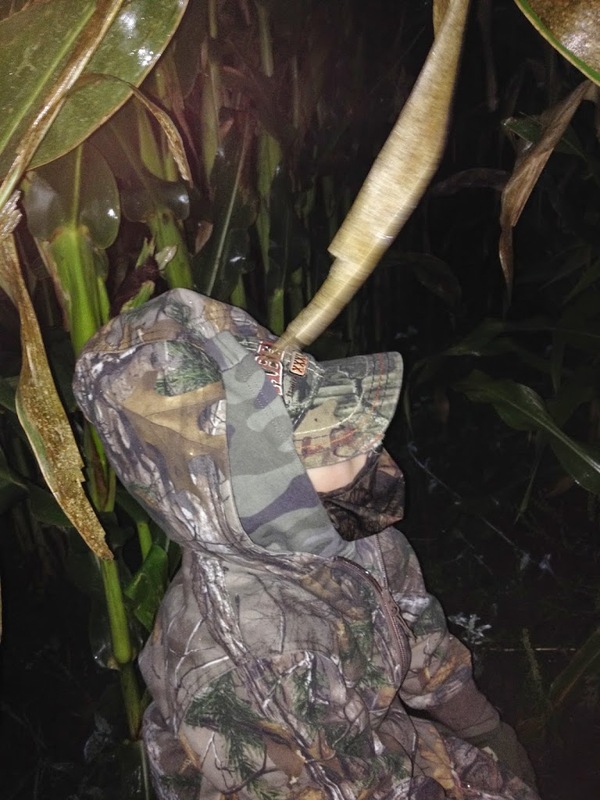 We found our spots inside the first few rows of standing corn, and thanks to a miniature folding seat that one of the hunters with us lent me, I had my boy comfortable and still as the starry night morphed into a calm, bluebird morning. 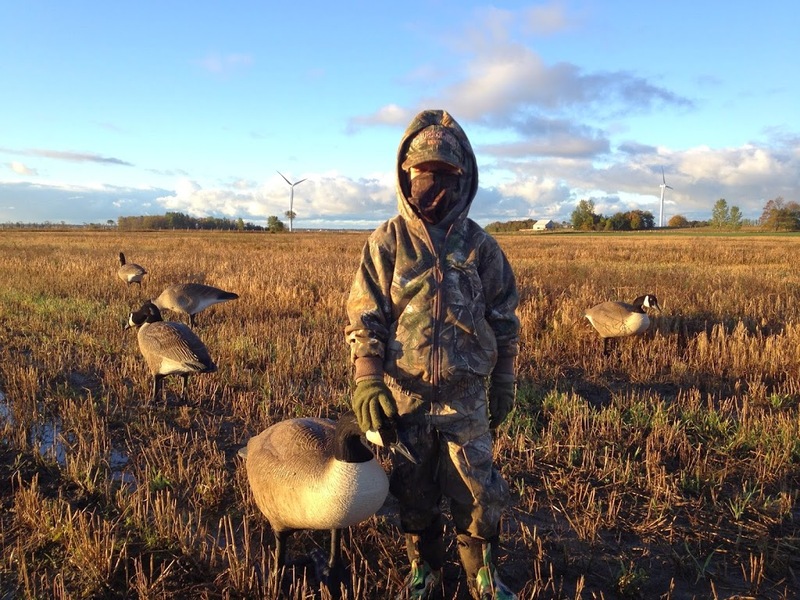 Nothing was immediately flying, and we turned my son free to wander in with the decoys and down the line, where he asked questions and chatted with the other hunters. We spied a thin string of geese to the southwest, and my son scampered back to his hideout next to me. We flagged and called the geese into range, and as they worked another group of honkers fell into an approach behind them. The first group landed, and we worked the back flock, hoping to get them to commit. Inexplicably, the back flock made it to within sixty yards or so and then slid off line and made for an exit. Simultaneously the group that had landed jumped up and began to depart. Far to my right someone called the shot, and I swatted the nearest departing bird. More shots rang out to the right and we had brought four geese to hand. I trotted out to the bird I had shot and brought it back to my hiding spot. My son hopped off his little seat and came over to inspect the goose, which was a good-sized bird. He asked if it was dead and he tried to pick it up; it was a just a bit too awkward and heavy for him to hoist, but he gave it a good shot. A few more groups came near and although we shot okay, it was a bit of a slow morning overall. But the tepid bird movement couldn’t dampen my spirits, and my son was buoyant to be out hunting. Eventually his small stomach pressed me to get him some breakfast, and the rest of the crew thought bacon and eggs was a solid plan. Just as he had in the pre-dawn, James went to the decoys and started to haul them in one at a time, gripping them awkwardly and more than once he almost took a spill in the muddy field. I was smiling pretty much throughout, and it was certainly one of those ‘proud Dad’ moments that you don’t forget. He was all smiles too, and when I asked him if he had enjoyed the hunt he blurted out that he never wanted to stop hunting. One of our hunting companions that day was GK Calls Field Pro-Staff member Scott McDonald, and after all the decoys were packed and the guns cased, he pulled out a knife and pried one of his several goose leg bands off his lanyard and gave it to my son. My son was a little shy and confused about what the band meant, but once it was explained to him he wouldn’t let go of it. I had an extra lanyard and a beginner duck call laying around, and it is safe to say that this memento has not been out of his sight in the week and a half since he received it. So I guess I have him hooked. That afternoon my son stayed in while myself and a few others hit a local cut cornfield and while we saw many birds, we just could not coax them to commit. One group of three strayed too close to my end of the setup and I scratched down two of them. We sat the field until the end of legal light, but that pair would be the only birds we would get that evening. When I arrived back at the farm, my son was pestering my Dad to go out in the morning for another hunt. I asked who he wanted to sit with and my son was adamant that he would sit the morning hunt with his Grandpa, so that was pretty cool. I had never had the opportunity to hunt with my grandfather, so this was another one of those special moments that only comes around once. 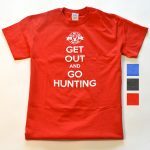 I mean how many ‘first’ hunts can there be? The Sunday morning was a repeat of the Saturday morning; James popped out of bed energetically, we ate a quick breakfast and geared up, making the field in the pre-dawn. My son again helped out with the decoys but this time, instead of hunkering down in the grassy fence line with me, he walked down the field edge and disappeared into the grass with my Dad. The wind was up and it was markedly colder than it had been twenty-four hours earlier, and the birds flew earlier. We were standing up chatting when a group of three mallards buzzed the spread. No one fired a shot. Shortly after that we flagged and called to a group of geese that swung wide past my friend Brian, but still within my friend’s normally lethal wheelhouse. He emptied his gun and all three birds winged away unscathed, which sometimes happens. While we tried to figure out how that had transpired we saw another group and we worked them down the other side of the decoys, right in front of my Dad and son. Dad reached out with his Remington 1100 and connected with one of the birds, folding it up instantly. 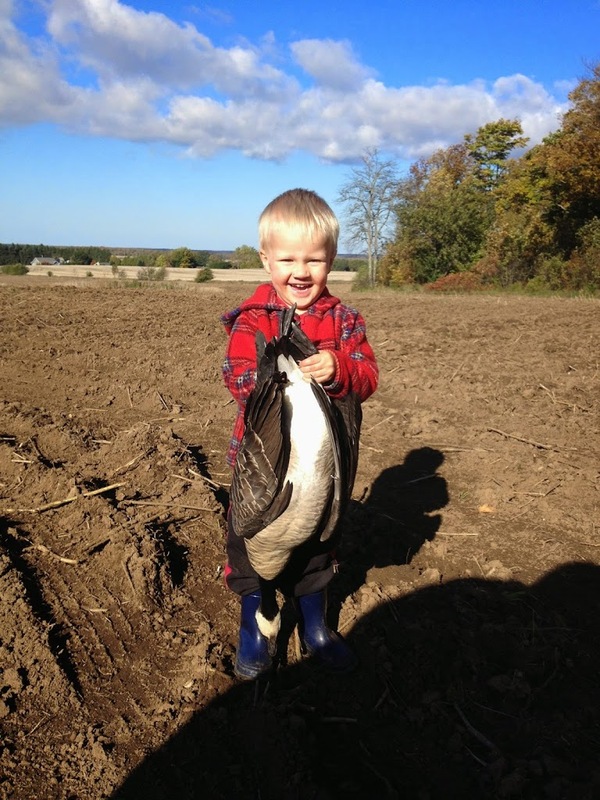 When he retrieved it, we noticed that it was not just any run-of-the-mill small goose, but it was a Cackling Goose, a first for Dad in nearly fifty years of waterfowling. My son had no difficulty holding this one, and neither did his younger brother when we all made our way back to the farm later that morning. We worked more birds and brought a few more to hand, with one winging away wounded before crash-landing in the next field over. My Dad took my son across the shallow ditch we were hiding next to, and they went on the retrieve. It was a convenient time to do so, as my son was getting a bit chilled and going for a walk in the sun perked his spirits up again. This retrieve marked the end of the morning and we once again packed the decoys and headed in for breakfast. Over pancakes and bacon my son told me all about the hunt with his Grandpa, how Grandpa told him how to hunt geese, and how he helped his Grandpa find the goose that “ran away” as he put it. That afternoon my son and I crashed into blissful afternoon naps before enjoying the traditional Thanksgiving dinner with all the cousins, uncles, aunts, nieces, nephews, grandparents, and friends. It was a fitting way to end the weekend, and it was an apt reflection of the passing on of family traditions to the next generations. For my part it looks like I may never get to hunt geese alone again. My new hunting partner is already asking about going every weekend we can, and that suits me just fine.